Bonjour lecteurs! I hope you had a fab weekend and you made the most of the weather? It was parfait for the wedding! And we also spoiled you with two giveaways to win a month’s worth of Piccolo Baby Food as well as some fancy PJs. 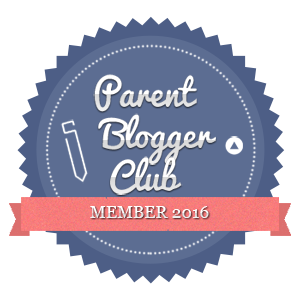 Well today, the entire family can join in our new Blog Anniversary Giveaway as you are in to win a £25 Voucher with A Little Bit Dotty! Let me tell you all about this sweet boutique first and then, you will see what I mean! Good luck and don’t forget to follow us on Instagram too for more gorgeous prizes! A Little Bit Dotty is a super sweet boutique online where you can purchase gifts for everyone. And you can find some cool items for the entire family – babies, mums, dads, siblings, grandparents and friends. They even have some Dad Survival Kit in case your man needs a bit of rest! Karen and Shelley, the founders, have carefully selected some products that they love because they are either fun, practical or just a little bit different! And because they are both mamans, we are pretty sure they know what we need, right? Not sure what to get for Father’s Day or looking for a birthday present a bit more original? This is for you! 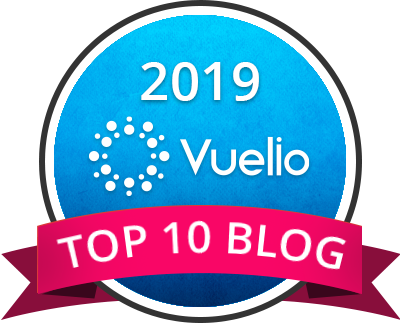 We have here a preview you can find on there, but there is so much more so have look for yourself after reading this post! In need of inspiration to get the parfait present? 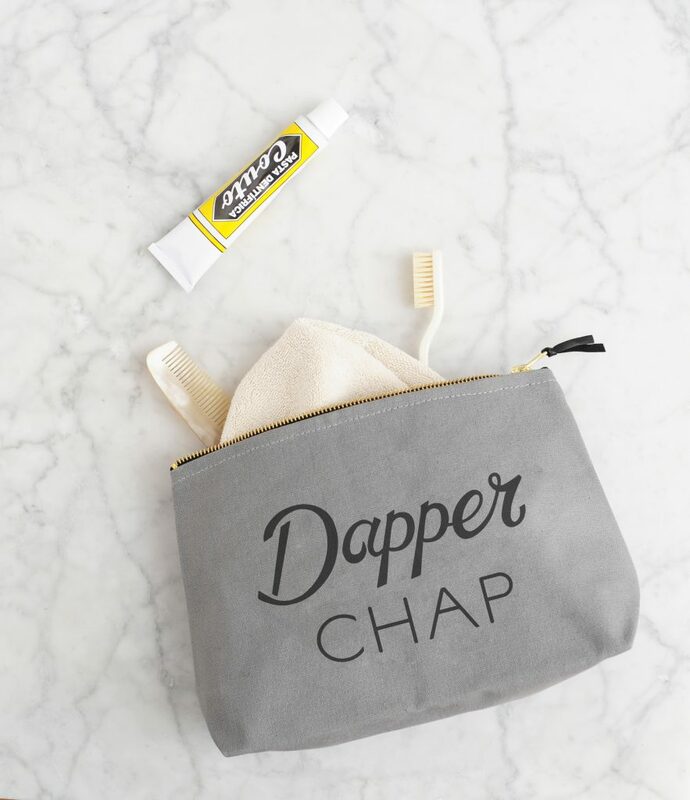 This Dapper Chap Wash Bag will help your other-half to be organised when you go away. I don’t know about you, but Grumpy Boyfriend never has his own wash bag and literally puts his stuff in mine! Like I have some spare space in there… I have beaucoup de beauty products and I reckon he could do with his own wash bag! Plus the words on it are pretty cheeky. J’adore! 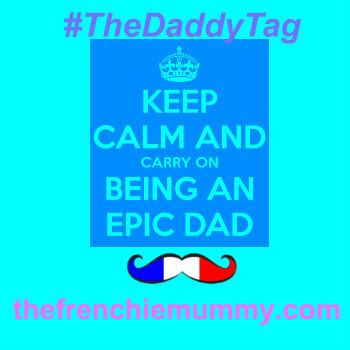 If you have a cool chap in the house that invades your space too, get him this fab bag for Father’s Day! Knowing someone is having a baby? Looking for something to relieve your little one? 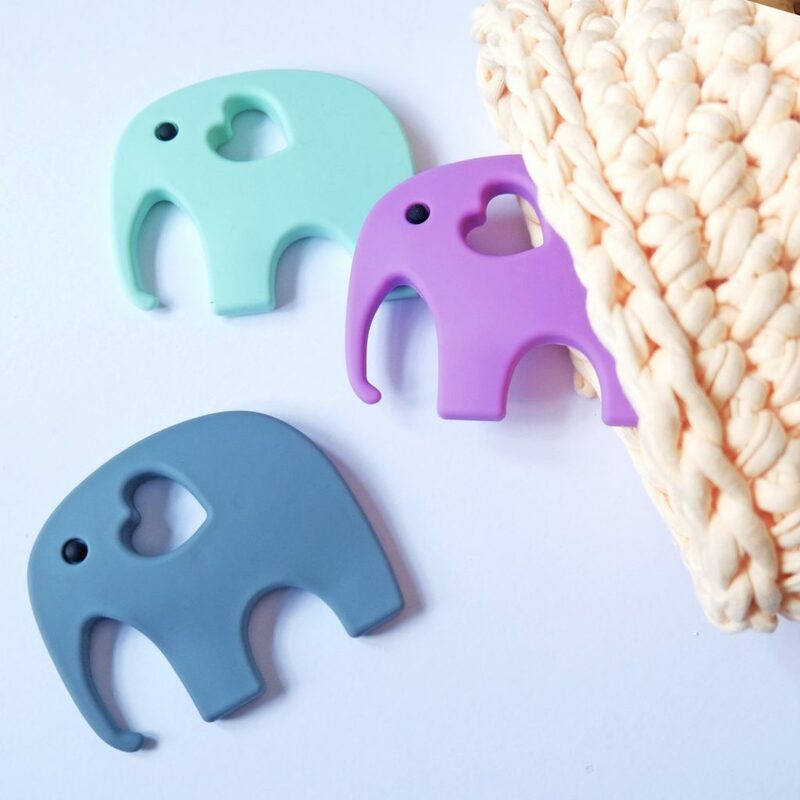 This Elephant Teether is so sweet! I am not sure what couleur I would actually select as I love them all! So useful and yet adorable! Made from BPA free silicone making it soft on baby gums, it is also a super cool design! Look at the whole range of teethers the boutique offers. They are just so adorable! Mother’s Day over? It doesn’t matter! Sometimes, you need to treat yourself and that’s it! So if you fancy using the £25 voucher on you, go and get a tote. 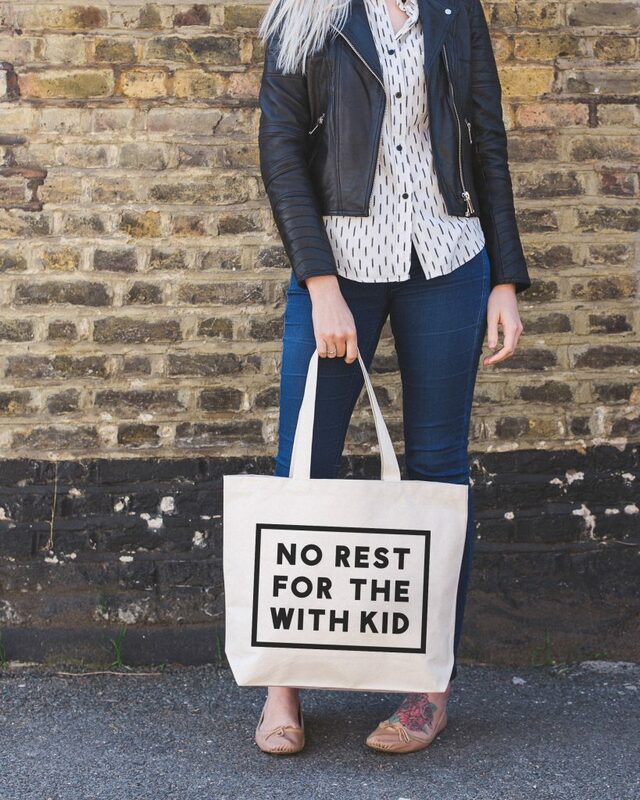 This bag is so funny because it is actually true when you are a maman! You never stop and you always need a cool bag like this to carry it all: food, nappies, wallets… The list is too long but you certainly know what I mean! Fancy a little something on this cute online shop? Or looking for some unique present? Enter now our new giveaway via Gleam & Win a £25 Voucher with A Little Bit Dotty! This giveaway starts on Monday 21st May at 6.30 pm and ends at midnight on the 21st June. 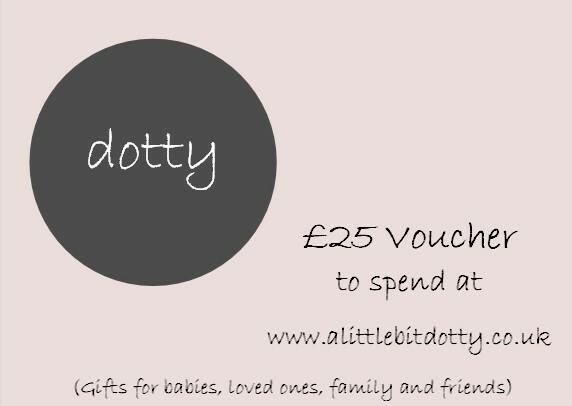 Merci for reading our new post from our Blog Anniversary Giveaways, Win a £25 Voucher with A Little Bit Dotty. Loving what you see? Why not check out our Giveaways‘ section for more fabulous prizes to win with us! See you tomorrow with one of our fave brands, Kit & Kin! Disclosure: This is a sponsored post written in collaboration with A Little Bit Dotty. Any pampering products such as the Sleep Easy Kit from Mama Mio. a spa day to relax and unwind ahhh bliss! I love anything that my children make themselves ? I love anything crafty as I’m a craftaholic but I think flowers says it all . A tidy house and five minutes peace. A voucher for a full body massage! My ideal present would be a handyman to do all those little jobs that are mounting up. There is nothing I like more than a relaxing bath, so a lovely bubble bath is a perfect treat for me. An overnight stay at a spa with a top to toe massage included. A day off would be nice!! Someone cleaning the house for me would be the best present. A hamper full of feel good products would be perfect! An enormous box of Lush bath bombs, a bottle of Chanel No5 parfum and a classy bottle of Merlot. Very nice. A photo album or scrapbook to store happy memories! Someone to do my ironing for a week/month/preferably forever! my ideal present would be something they have made themselves and thought about! it would be fab to have something i can keep forever that they have put time and effort into making! A Spa day, and a delicious and nutritious lunch. Would assist with rest, relaxation and re-energising. My dream is to be booked into a five star hotel and be able to lie in bed watching rubbish like Love Island and scoff sweets, chocolate and crips! Something quirky…i love the slogan bag you advertised above! Right up my street! Anything handmade or something I wasn’t expecting. My ideal gift would be a nice set of bath bombs! Perfect gift for me would be a family home I knew my children would be in forever. Fingers crossed a mortgage is on the horizon! To see my children happy and healthy! Really smelly bath salts and a good book to read in the bath with a glass of wine.